The Buea Mayor Patrick Esunge Ekema Exposed As A Fraudster In Gaining Admission Into Buea University With A Fake GCE Advanced Level Certificate. 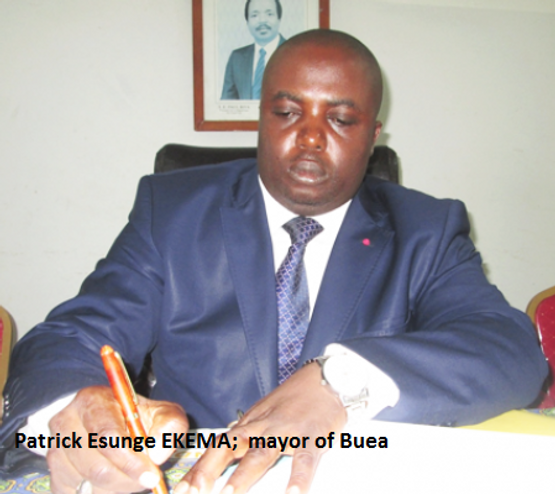 The Buea Mayor, Patrick Esunge Ekema, is under fire after being exposed for forging his admission to study at the University of Buea. Evidence presented by the Regional Secretary of the National Commission on Human Rights and Freedoms, South West Regional Branch, Christopher Tambe Tiku, points to the fact that the said mayor who today boost of a First and a Master’s Degree in History was unqualified to be admitted for undergraduate studies in the above university in the first place. Instead of at least a pass in two subjects at the General Certificate of Examination (GCE) Advanced Level, Ekema is reported to have gained admission with one subject, History, which he passed with an “E” grade during the June 1996 session of the examination. He earlier sat for the same exams in June 1995 and passed in no subject. Reports gathered from the GCE Board indicate that he registered the same exam seven times (1995, 1996, 1997, 2001, 2002, 2003, and 2007) but scored an E grade in in History as his highest grade in all the sessions. Worst still, he was absent in the 2002, 2003 and 2007 sessions of the examination. 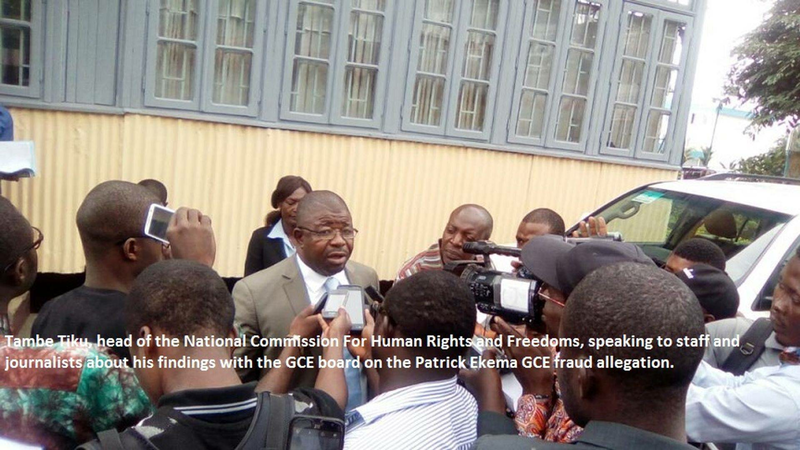 Talking to the press on Friday June 7, 2017, Mr Tambe Tiku, explained that for Patrick Ekema to re-register for the GCE exams in 2007 a year after obtaining his B.A. Degree in History leaves a lot of questions to be answered. Probably, it was because he was being haunted by his conscience for not having a qualification he claimed to. While presenting a report on alleged discrimination on admission procedure into the University of Buea, Mr. Tambe Tiku stated that it is very difficult to ascertain whether the Mayor forged his way to gain admission in complicity with the University. He pointed that it is likely Patrick Ekema enrolled in 2003 when admission still was done manually by abusing his office as a support staff of the student’s affairs office to introduce fraudulent papers to gain admission. Mr. Ekema was recruited to work in the university with an Ordinary Level Certificate. He maintained that after establishing this genre of fraud committed by an administrative authority, it is now left on the University of Buea and the Judiciary to take their responsibility. The Regional Secretary of the Human Rights Commission explained that Mayor Ekema still has the right to prove their investigation wrong by publicly providing evidence that he genuinely gained admission into the University. 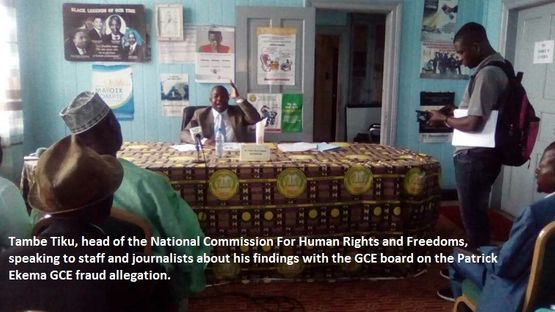 Worth noting is the fact that this investigation was prompted due to grievances presented to National Commission on Human Rights and Freedoms, South West Regional Branch on alleged discrimination on admission procedure into the University of Buea as well as reports on social media shaming the said mayor of gaining admissions fraudulently into the university.